Oppositional geometry (OG) is a new branch of mathematics made of “oppositional structures” and of transformations between them. The main structures of OG are the α-, β- and γ-structures. 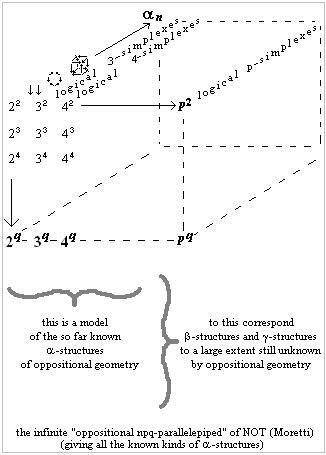 They are mutually related by a rule of OG-translation, which allows, for instance, to translate modal logic or generalised quantifiers or conceptual networks (expressed via γ-structures) into “oppositional hyper-geometry” (expressed via βn-structures). The α- and β-structures are made of “logical poly-simplexes of dimension m” (most of the time logical bi-simplexes of dimension m), generated by the Aristotelian p^q-semantics (and their Aristotelian p^q-lattices). The βn-structures yield a new notion of mathematical equivalence, the βn-equivalence (between γ-structures).